These past few weeks, I’ve been pondering what my intention for 2018 is to be. During 2017 I’ve had the intention of Wholeheartedness. A few years prior I’ve also gone into the new year with an intention, and I intend to do so again for 2018. Somewhat surprisingly for myself, what’s been popping up has been different thoughts on going more analog, of letting go of habits of checking email, facebook, messenger and the likes once every few seconds, of deleting various app’s from my IPhone, app’s which are merely a mental distraction (and time trap), and not really value-adding at all. So as a reminder, of what it really is I am looking for (more connection, more conversation, more value-adding interactions and smarter use of my time. As well as less mindless habitual waste of my time. If I am to rest, and relax, I want to do so in the analog.) I gift you Sherry Turkle in conversation with Jonathan Fields in Good Life Project. Sherry is pro-technology, but a proponent of a mindful and intentional use of technology, which is precisely what I intend to explore deeper during 2018. She’s gotten a lot of flak for her thoughts on the matter, but I honestly think it’s well worth reflecting upon what it is we do with technology, and what it is doing to us (or perhaps more correctly: what it is I am letting technology do to me – I am no helpless victim here!). It’s not all positive, in the same way that I don’t think a n y t h i n g exists that is entirely positive. There’s two sides to every coin, and there’s also my strong belief that whatever works for me might not necessarily work for you. We might have different needs, ideas, ways to operate in the world, to relax, to get inspired and so on – and hence, during 2018 I will be exploring what a more mindful technology use will do for me. On an interesting side note, this is my use of digital technology so far this Christmas morning: Sitting in bed, writing on my IPad, listening to Spotify on my IPhone, after having checked my email (personal and work-accounts at that), my Messenger (said good morning to my eldest who’s up and about earlier than the rest of us), my Facebook- and Instagram-feeds, thrown my first Pokémon Go-ball, done some Wordfeud and WordBrain-puzzling and finished a fifteen minute Headspace meditation. 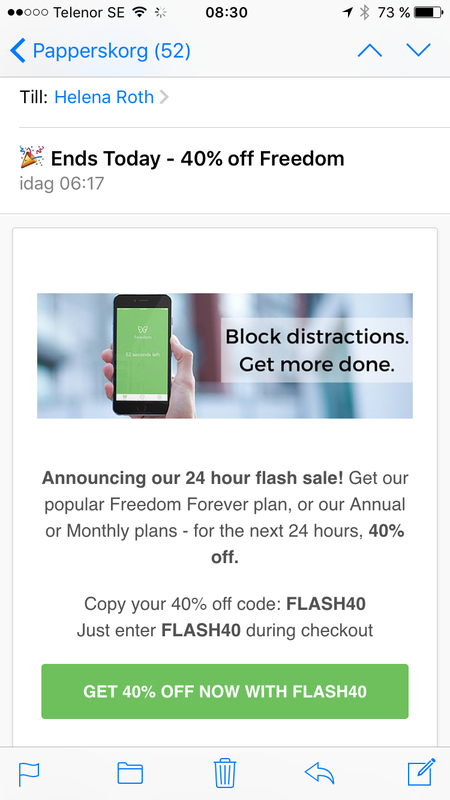 Oh, plus buying a one-year subscription to the Freedom-app, using their 40% discount code (FLASH40) I received in my inbox this morning (valid 24 hours). 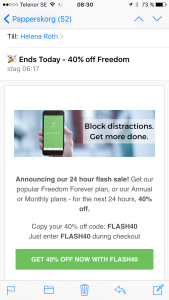 So yeah – a bit of intentional use of technology is just what I want – the freedom to explore more of an intentional life, not freedom from technology! Important distinction for me.